Today was the perfect day for hearty comfort food. Opening the fridge the first ingredients I laid my eyes on were half a pumpkin and a bottle of cream – the decision was made: Creamy Roast Pumpkin and Garlic Soup with home baked bread. 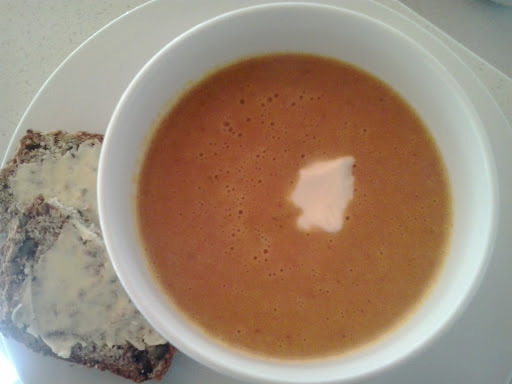 My husband’s first words after tasting the soup were “Rich, but delicious.” A perfect lunch. Remove skin and pips from pumpkin and slice into thick slices. Cut onion in half, without removing skin. Place pumpkin, onion and whole garlic cloves onto baking tray. Drizzle with oil and sprinkle with salt. Roast for 1 hour but begin checking after 45 mins as you don’t want it to caramelise too much. Remove from oven and place pumpkin into blender, along with onion flesh. Squeeze squishy garlic out of the skin carefully – you don’t want any of the skin falling in – and add to blender. Add 1 cup chicken stock and blend until smooth. Pour mixture into a pot, add remaining stock liquid, cream and honey. Stir and reheat gently. Don’t let it boil. Heat the oven to 180°C and lightly grease the loaf tin. Combine the flours, salt, bicarb, nuts and seeds in a large bowl. Add the oil, yoghurt (or buttermilk) and honey to form a soft dough, adding a little more milk if necessary. You don’t need to knead this bread, but I find that working the final mixture with my hands to form the dough works well. Place into the prepared loaf tin and level out the top without squashing it. Brush the top with a little milk if you like and sprinkle a few seeds over the top. Rest in the tin for a few minutes before turning out onto a wire rack to cool.